While we were camping in Angeles Nation Forest, we came across a few bear tracks! We happened to pass by a tree that had claw marks going up the trunk. The other 2 were prints in the ground that made it clear we were in bear territory! Now all I’m missing is a picture of an actual bear! Its on my nature-spotting bucket list! Do you have any cool bear pics? Email them to girlycamping@Hotmail.com and I may feature them in an upcoming post! A “grizzly” situation to be in, if you aren’t prepared. not bear prints – but cougar..
A few years ago we were camping in West Virginia, and woke up to find cougar tracks through our campsite. Our dog was camping with us, and didn’t even make a sound. He has since been fired from his position as our head of security. Oh, how exciting! That top one is a great photo! I’ve seen lots of black bears on my hikes in Northern California, but never got a shot because in those days I wasn’t so adept at having the camera at the ready. 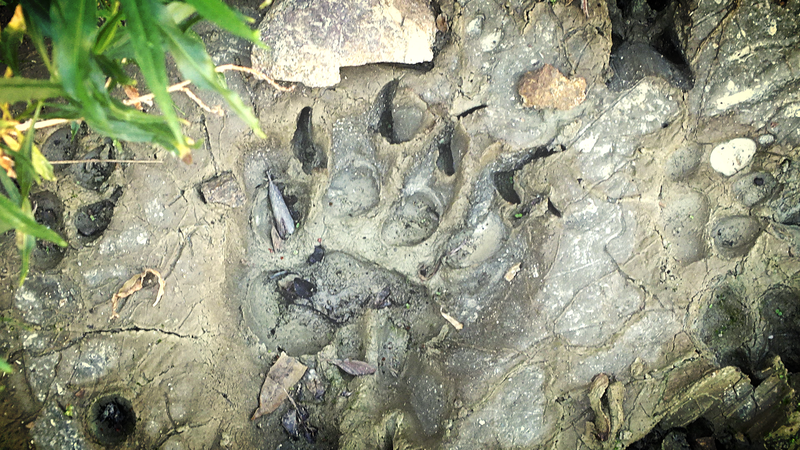 I’ve taken photos of bear prints too, which are wonderful, but just not the same thing as getting to see one. I hope when you spot your bear, you can get your camera out before she runs away!